Whether you're new to medication safety or an experienced Medication Safety Officer (MSO), this guide will be an invaluable resource. 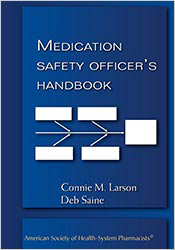 The Medication Safety Officer's Handbook offers expert guidance in every area of your work, from setting up safety systems to dealing with personnel problems, along with sample forms, checklists and other job tools. You'll not only learn strategies for making changes, but also systems for error reporting and analysis, and guidance on managing adverse outcomes. 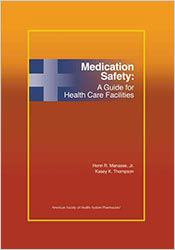 Written by experts for pharmacists and nurses who oversee medication safety, it is the essential reference for all MSOs. What are all the responsibilities of an MSO? With no formal authority, how do I make changes? How do I design a template for a modified root cause analysis? What should be included in a medication safety orientation for staff? Where is the most trustworthy information on a particular safety topic? You'll find detailed information for all areas of medication safety, from automated dispensing cabinet override criteria to examples of a Sentinel Event alert gap analysis. 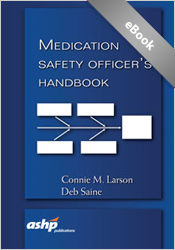 With the Medication Safety Officer's Handbook by your side, you're never at a loss for answers. This product is available as a part of a package.